This sculpture is a fascinating combination of a series of Gilbert's sculptural concepts for the Clarence memorial of around 1898. Originally the list of figures of Saints, that were to surround the Tomb of the Duke of Clarence, did not include a figure of St. Catherine; however in the finished monument Gilbert included figures of both St. Catherine of Siena and St. Catherine of Egypt. The final figures were modelled for the tomb in 1926-28. The statue, now known as The Miraculous Wedding, is a fusion of the imagery of both St. Catherine of Egypt, represented as a heavily veiled Intern woman, and St. Catherine of Siena, who mystically wed the Christ Child in a vision imparted to her by God. The figure stands on i similar base to that of the figure of St. George, a series of swirling clouds and dragon scales, imparting the illusion of the vision. Gilbert rejected the statue for the Tomb of the Duke of Clarence, but in October 1900 a cast was sold to a Mrs Richardson and is now in a parish church in Scotland. Another from the Handley-Read collection is in Birmingham Art Gallery, while a third, acquired by Revd. J.W.R. Brocklebank around 1913, is in the Ashmolean Museum, Oxford. Bowman, Robert. Craft and Creation — 2005. London: Robert Bowman Gallery, 2005, pp. 68-69. Dorment, Richard. Alfred Gilbert. New Haven and London: 1985. Pp. 213-5. 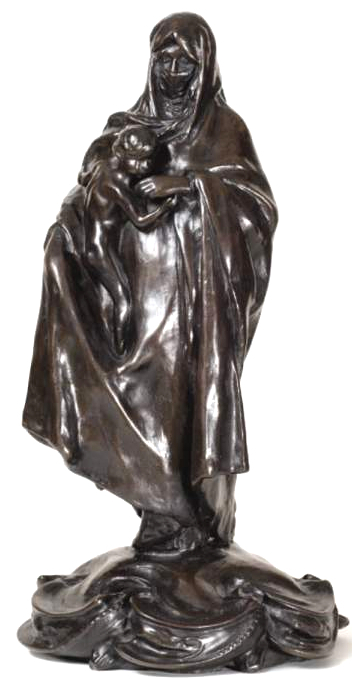 Gibson to Gilbert: British Sculpture 1840-1914. Exhibition catalogue. London: The Fine Art Society, 1992. No. 33.